Set Wet offers unique combo of Funky Avatar No Gas Deo and Cool Hold Hair gel. The fragrance of No gas deodorant keeps you fresh whole day and the after shower hair cream gives you the perfect hair look for parties and daily routine and protects your hair from damage. The body care combo can be taken anywhere with you, that saves you from the extremities that life throws on men. 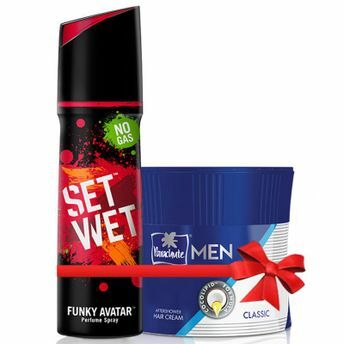 The combo consists of a pack of Set Wet no gas Funky deodorant and Parachute Men's after shower hair cream.